*Corresponding Author: Shahin Asadi, Molecular Medicine Genetics Harvard University. Director of the Division of Medical Genetics and Molecular Research, Division of Medical Genetics and Molecular Pathology Research, Massachusetts, Harvard University of Medical Sciences, Department of Medical Genetics, Iran. Dopamine (DA) is an organic compound of the family of catecholamine’s and phthyllamines, which plays a vital role in the body and brain. Dopamine is synthesized from its precursors in the brain and kidneys, and dopamine is also synthesized in most plants and animals. Dopamine plays a role in the brain as a neurotransmitter and in the blood. Dopamine is mainly stored in the vesicles of dopaminergic neurons, as well as in the adrenal glands. In the brain, there are several dopaminergic pathways called dopaminergic pathways, dopamine plays the most important role in creating pleasure and rewards. Increasing dopamine in certain areas of the brain that is known as the Reward Center creates a sense of rewards in person, so dopaminergic drugs they are mostly exploited. Dopamine also plays a role in controlling the motor system, with the disappearance of dopaminergic neurons from Parkinson's disease. Other functions of dopamine control the brain and regulate the secretion of hormones. Dopamine reduces prolactin secretion by stimulating two dopaminergic receptors (D2), thereby affecting milk production . Outside of the brain and in the body, dopamine plays a hormone role, dopamine prevents the release of norepinephrine in the blood and causes blood vessels to stench, increases sodium excretion and urine volume, decreases insulin secretion from the pancreas and reduces gastrointestinal motility Reduces. Dopamine transporter deficiency syndrome is a rare genetic disorder that causes impaired motor activity. People with dopamine deficiency syndrome create a steady pattern of involuntary muscular and stable contractions called dystrophy. The dystrophy is extensively affecting many different muscles. The dopamine transfer deficiency syndrome is due to the mutation of the slc6a3 gene, which is based on the short arm of chromosome number 5 as 5p15.33. Dopamine transporter deficiency syndrome is a rare genetic disorder that causes impaired motor activity. This condition is also known as the diurnary of neonatal Parkinsonism, since motor problems usually begin in the neonate period and become worse over time . 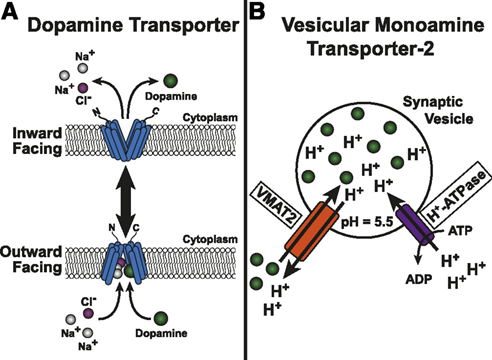 Figure 1: Schematic of the dopamine transfer vector (A) and the VMAT2 (B) gene. Signs and clinical symptoms of dopamine transporter deficiency syndrome. People with dopamine deficiency syndrome create a steady pattern of involuntary muscular and stable contractions called dystrophy. The dystrophy is extensively affecting many different muscles. Congestive muscle spasms and spasms can cause problems in everyday activities, including talking, eating, drinking, collecting objects and walking . As this situation worsens, people with Parkinson's develop a group of motor disorders such as tremor, unusual slow motion (bradycinsis), stiffness, and inability to keep the body correctly and balanced (instability). Localized). Other symptoms and symptoms that can occur in the dopamine deficiency syndrome include abnormal movements of the eye, hypomimia, drowsiness, frequent episodes of pneumonia, and digestive problems, including the relief of acid gastric acid esophagus (gastric reflux) and constipation . People with dopamine transporter deficiency syndrome may have a short life span, although the long-term effects of the disease are not fully understood. Children suffering from the disease die from pneumonia and respiratory problems. When the first signs and symptoms of the syndrome appear later in life, people with it may live up to their adulthood . Figure 2: Schematic of neurotransmitter dopamine and its receptor. The dopamine transporter deficiency syndrome is due to the mutation of the slc6a3 gene, which is based on the short arm of chromosome number 5 as 5p15.33. The gene provides instructions for the synthesis of a protein called dopamine transfer. This protein lies in the nerve cell membrane (neurons) in the brain, where the dopamine molecule is transmitted to the cell. Dopamine is a biochemical messenger (neurotransmitter) that relays signals from a neuron to another neuron. Dopamine has many important functions, including playing a role in the recognition, motivation, behavior and control of movements . The mutation in the slc6a3 gene may interfere with the function or decrease the dopamine transporter. Functional protein deficiency impairs the signaling of dopamine in the brain. Although dopamine plays an important role in motion control, it is still unclear how changing dopamine signaling causes specific motor disorders in people with dopamine transporter deficiency syndrome . Figure 3: Schematic view of located slc6a3 gene on Chromosome No. 5. Studies show that the age at which the symptoms of this syndrome appear is related to how much the performance of the carrier of dopamine affects. Affected people have behavioral problems that start in childhood, often having dopamine transporter activities that are less than 5% normal. Those who appear to experience movement problems in or after childhood, require a higher rate of dopamine transfer activity, although still less than usual. Researchers believe that a higher level of dopamine transmitter activity may delay the onset of disease in these individuals . Dopamine transporter deficiency syndrome follows an autosomal recessive hereditary pattern. 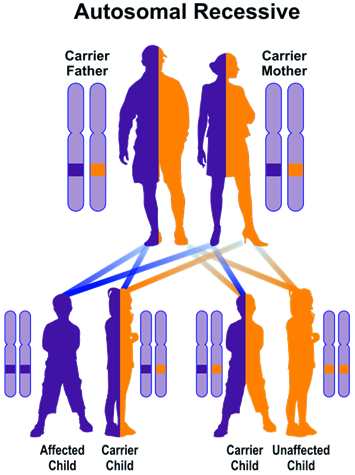 Therefore, in order to create this syndrome, two copies of the mutated gene SLC6A3 (one parent and the mother) are needed, and the chance of having a child with autosomal recessive syndrome is 25% for each pregnancy . Figure 4: Schematic representation of neurotransmitter types. Dopamine deficiency syndrome is a rare neurogenetic disorder, of which only 20 cases have been documented in medical literature from around the world . 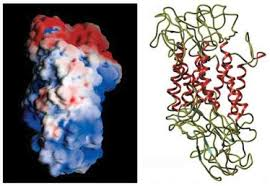 Dopamine transporter deficiency syndrome is diagnosed based on the clinical and physical findings of the patients and some pathological and neurological tests. The most accurate method for detecting this syndrome is the molecular genetic testing of the SLC6A3 gene to investigate the presence of possible mutations . Figure 5: Schematic view of hereditary pattern of dopamine transporter deficiency syndrome. The strategy for treatment and management of dopamine deficiency syndrome is symptomatic and supportive. Treatment may be done by a team of experts, including a neurologist, gastroenterologist, orthopedic specialist and other health care professionals. There is no standard treatment for this syndrome and all clinical measures are needed to reduce the suffering of the infected person. Genetic counseling is also important for all parents who want a healthy baby . Figure 6: Schematic of the slc6a3 protein packet structure. Dopamine transporter deficiency syndrome is a rare genetic disorder that causes impaired motor activity. People with dopamine deficiency syndrome create a steady pattern of involuntary muscular and stable contractions called dystrophy. The dystrophy is extensively affecting many different muscles. The dopamine transporter deficiency syndrome is due to the mutation of the slc6a3 gene, which is based on the short arm of chromosome number 5 as 5p15.33. There is no standard treatment for this syndrome and all clinical measures are needed to reduce the suffering of the infected person. In the near future, gene therapy techniques will be able to improve the health of these patients. Blackstone C. (2011). Infantile parkinsonism-dystonia due to dopamine transporter gene mutations: another genetic twist. Lancet Neurol. (1):24-5. doi: 10.1016/S1474-4422(10)70280-5. Epub 2010 Nov 25. Blackstone C. (2009). 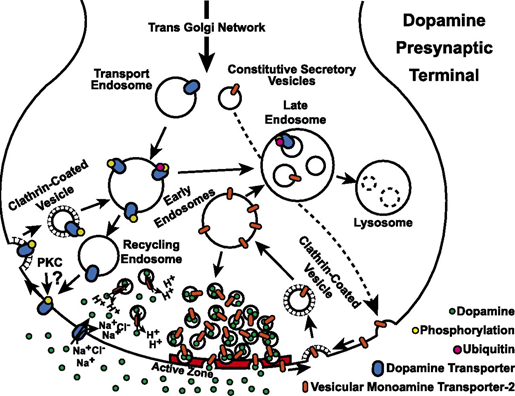 Infantile parkinsonism-dystonia: a dopamine "transportopathy". J Clin Invest. Jun; 119 (6):1455-8. Kurian MA, Li Y, Zhen J, Meyer E, Hai N, Christen HJ, Hoffmann GF, Jardine P, von Moers A, Mordekar SR, O'Callaghan F, Wassmer E, Wraige E, Dietrich C, Lewis T, Hyland K, Heales S Jr, Sanger T, Gissen P, Assmann BE, Reith ME, Maher ER. (2011). Clinical and molecular characterisation of hereditary dopamine transporter deficiency syndrome: an observational cohort and experimental study. Lancet Neurol. Jan; 10 (1):54-62. doi: 10.1016/S1474-4422(10)70269-6. Epub 2010 Nov 25. Kurian MA, Zhen J, Cheng SY, Li Y, Mordekar SR, Jardine P, Morgan NV, Meyer E, Tee L, Pasha S, Wassmer E, Heales SJ, Gissen P, Reith ME, Maher ER. (2009).Homozygous loss-of-function mutations in the gene encoding the dopamine transporter are associated with infantile parkinsonism-dystonia. J Clin Invest. 2009 Jun;119(6):1595-603. doi: 10.1172/JCI39060. Epub May 26. Ng J, Zhen J, Meyer E, Erreger K, Li Y, Kakar N, Ahmad J, Thiele H, Kubisch C, Rider NL, Morton DH, Strauss KA, Puffenberger EG, D'Agnano D, Anikster Y, Carducci C, Hyland K, Rotstein M, Leuzzi V, Borck G, Reith ME, Kurian MA. (2014). Dopamine transporter deficiency syndrome: phenotypic spectrum from infancy to adulthood. Brain. Apr; 137 (Pt 4):1107-19. doi: 10.1093/brain/awu022. Epub 2014 Mar 10. Citation: Shahin Asadi. (2019). The Role of Genetic Mutation in Gene Slc6a3 in Dopamine Transporter Deficiency Syndrome. Journal of Brain and Neurological Disorders 1(1). Copyright: © 2019 Shahin Asadi. This is an open-access article distributed under the terms of the Creative Commons Attribution License, which permits unrestricted use, distribution, and reproduction in any medium, provided the original author and source are credited.